CATHIE JUNG'S FREQUENTLY ASKED QUESTIONS! The photo was done by Ruven Afanador for the Eisenstaedt Awards and shown in the collectors edition of Life magazine the Eisie issue spring 1998. The tooled leather corset dress was shown at the F.I.T. corset display. Columbia photographer Ruven Afanador's picture's of extreme corseting were intended as an homage to Pierre Molinier, a fetish photographer who worked with much attention from the 1920s through the '70s. Molinier's subject was his own body, and when he needed a corseted model, he simply donned a corset. Afanador didn't have to go to such extremes. He found a woman who was dedicated to cinching and were more than happy to pose for him. He's glad she did. Says Afanador, "On the day I was shooting the photos, I knew it would turn out to be an incredible day in my career." The 2nd edition of Fashion & Fetishism by David Kunzle was published august 2004. It is updated and restructured so it is recommend even for those who have 1st edition of the book. ‘After an early familiarization with corsets, my middle years of non-corseting, and three natural childbirths and two cesareans left me with absolutely no abdominal muscle tone. I returned with very long corsets, in which I found it easier to stay laced than to be uncorseted and recorseted. My only physical problems have been with skin chafing. Comfortable at 16 and 17 inches, for special occasions I can lace down to 15’. Cathy is surely now, and has been for a decade or more, the best - publicized tight - lacer in the USA. 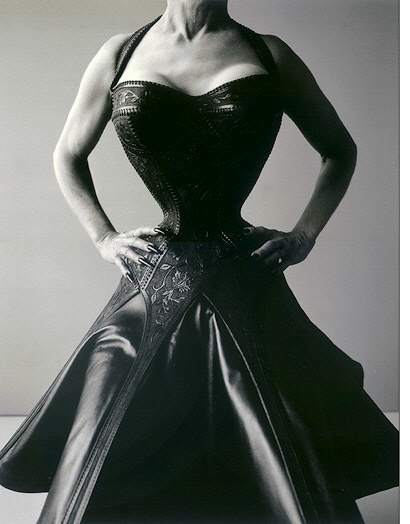 Her appearance at the opening of the Museum of Modern Art’s “The Corset: Fashioning the Body”, curated by Valerie Steele, elicited a report in the Los Angeles Times in praise of the ‘well-preserved Connecticut woman’ who has permanently shrunk her waist from 28 to 15 inches. She won the ‘Achievement in Tight lacing’ award at the 1989 Dressing for Pleasure gala, among others, and has appeared on TV internationally, notably in Tokyo, and Germany, where her husband, Bob Jung, an orthopaedic surgeon who encourages her habit, addressed the audience on the basis of X-ray photographs of his wife, to show that all is well within the 38cm circumference, ‘the smallest (proportionately) in the world’ (she is 5ft 6in tail, 39 bust and hips). Such photographs, which are unique of their kind, have appeared in fashion histories, notably Valerie Steele’s, who in her latest Corset apotheosised her in a blaze of polychrome luminary glory over a full page.